The Blacksmith - FireHouse Ironworks Ltd.
A native Cape Bretoner, Grant Haverstock began his career in metal work as a machinist and later studied tool and die technology. Grant worked across Canada in various trades from British Columbia to the Arctic before returning home to Cape Breton to open FireHouse Ironworks Ltd.
Grant came into blacksmithing after many years in the metal trades. He immediately fell in love with the physicality, artistry, and creativity of blacksmithing and has been doing it ever since. Haverstock opened his blacksmithing shop, FireHouse Ironworks, in 2011. Passionate about educating the public and encouraging others to try blacksmithing, Haverstock designed his studio to house four coal fired forges in order to accommodate hands-on instruction in the craft. It is the only blacksmith training facility of its kind in Eastern Canada. Since opening, FireHouse Ironworks Ltd. has produced ornamental and functional ironwork for clients across Atlantic Canada and has instructed students from across North America in the heritage craft of blacksmithing. Grant Haverstock is also the president of the Cape Breton Blacksmiths Association (CBBA), a non-profit group with a membership of 50+ blacksmiths from across the province. Under his leadership, the CBBA hosted Cape Breton’s first international blacksmithing conference, Forge 300, in 2013. 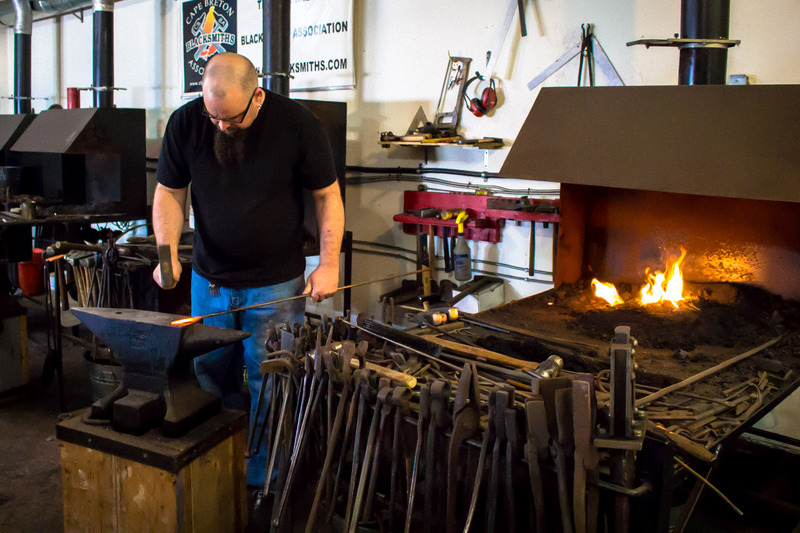 This well-received event brought top blacksmith-artists from the United States, Canada, Ireland and the Netherlands to demonstrate for blacksmith enthusiasts from across North America. The CBBA will also be hosting the next canada-wide blacksmithing conference, CanIRON X, in Cape Breton in 2015 to further promote the craft of blacksmithing. In 2013, Grant Haverstock was the only Canadian to serve on the Board of Directors for the Artist-Blacksmith Association of North America (ABANA), the largest blacksmithing association world-wide. You’ll get great results from our talented blacksmith! Let us show you what we can do.